Rest easy knowing you’ve taken care of the music at your next big event when you choose RythmTrail Caribbean steel drum band. We play nearly any production in Cape Coral, including beach weddings, unique corporate bashes, house parties, birthday parties, wedding rehearsals, and more. 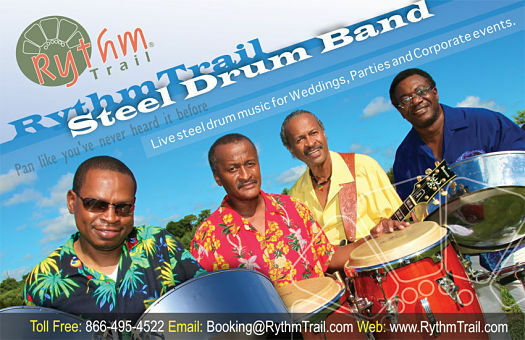 As one of the most experienced steel drum bands in the area, RythmTrail’s 20 years of playing gigs by real native Caribbean islanders makes us one of the most trusted steel drum bands around. We can play many styles, ranging from steel drum music and Calypso to Soca and Reggae. Don’t need our full 4-man group? Take your small event to the next level with a solo performance. For all your needs in the Cape Coral area, from events both large and small, our steel drum band can cover it all. Don’t live in Cape Coral, but still want to experience the sounds of the Caribbean? RythmTrail travels all over Florida and the United States, and even performs internationally! Wherever you go, and whatever the occasion, you can count on our band. With us just a phone call away, don’t gamble on your special day. Our rivals can’t compare to our professionalism and talent, so why bother? We’re at home playing upbeat music for your upcoming house party, and dialing it back for an intimate wedding ceremony. Trust us to keep your events going, or take control with your own customized playlists featuring your favorite songs. If your ready to be swept away by the sounds of a steel drum band at your next event, don’t delay! Our schedules fill up fast, so call us today at 866-495-4522, or get a free quote from us online. RythmTrail will help you turn your plans into a day to remember.